Great Stone Esentepe Park is one of the best properties listed in Cyprus44 property reviews. Great Stone Construction is a family run company, established in 2000 by UK-born partner Taser Niyazi Hilkat. Great Stone began by constructing just two villas near Kyrenia, expanding into larger projects of up to 25 villas. Hilkat's brother-in-law Salih Borat is also a business partner in Great Stone, and brings years of experience in the construction industry to match Hilkat's own business experience. Great Stone have developed a winning formula of building small developments of villas across North Cyprus to the same design, so you always know what you’re getting with a Great Stone development! The Esentepe Park development offers great sea and mountain views, with each detached villa enjoying a small but exclusive garden area within a boundary stone wall. Each villa has a five ton water storage tank at ground level and a one ton tank on the roof, an important consideration in an area where the water supply is a major environmental issue. You also have your own private driveway and parking area and the option of an 8 metre by 4 metre overflow style swimming pool. The villas have a striking two storey design, with an unusual bay window-style extension that extends beyond the house footprint into the grounds, with a balcony on top. The design gives the villas a compact form but with generous living inside. There are four bedrooms all with air conditioning, and three bathrooms, as the master bedroom has an en suite. Central heating and a fireplace are optional extras that will add value should you wish to let the property for year-round occupancy. Inside, the exposed beams of the ceiling is bound to be a talking point, giving the living space a light and airy feel. You can also specify the colours of the floor tiles and those in the kitchen and bathrooms, so you can make your mark on a villa at Great Stone Esentepe Park as much as you wish! 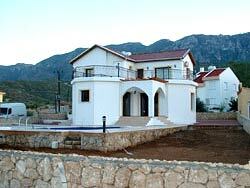 The company offers a five year structural guarantee on their villas. If you are looking at Great Stone Esentepe Park villas as a property investment in North Cyprus, the company also offer a property management service, covering such essentials a paying monthly bills and weekly property checks, as well as keeping the garden in good order - and well watered!. Great Stone will also organise pool maintenance if required, and offer building services should you wish to extend or alter your villa at any stage! Great Stone Esentepe Park is a bit of a rarity, a small-scale developments in the Esentepe area, and probably all the better for it! If you prefer dealing with individual developers first hand rather than through sales agencies, and want a more intimate location for your villa rather than a faceless complex, this could be the ideal North Cyprus property development for you. This web page is served on 19 April 2019 at 23:17:32.